I'm shopping around for birthday presents at the moment and I'd like some necklaces that will last a long time and be a memorable reminder of my 40th birthday. The 2nd set is an ultra long set of pearls, which can be strung at least a couple of times around the neck. Kenneth Jay Lane, the King of costume jewellery, counts former first ladies Jacqueline Kennedy Onassis, Nancy Regan, Barbara Bush and Hillary Clinton as satisfied clients-so if its good enough for them, its a fabulous choice for me!! So, I'm just awaiting delivery of my chosen presents and as long as I'm happy, I'll be showing them off! Go you! That's fantastic. Lovely stuff. You make 40 so young! So pretty! Wishing a fantastic year of fun and great memories with travel, friends and family. Thank you so much for the note, too. Can I take you out for a birthday drink...when I come to London in July? Great choices - I didn't know that range was sold on QVC - I normally drool over it on net-a-porter, so am pleased to have found this out, Thanks Sharon! Oh and you must meet up with Wendy - how wonderful that she suggested that! Is pearl your birthstone as well? I love them! 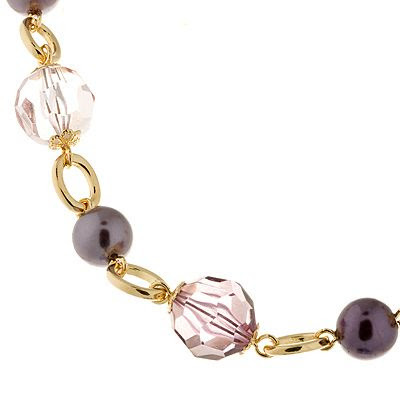 I've been happy with my prior QVC jewelry purchase so I say you've done well! :-D Happy b-day! Aren't pearls a marvel? I just love them. It's so feminine and classic! Looks like you've got some fantastic jewelry! Gorgeous presents. There's nothing quite like timeless, classic pearls is there. Are you sure about your age????? Those pearls are just gorgeous, dear. pearls are classic they can do not wrong! Hope you have a good bday! Hi everybody-thanks so much for the fabulous comments, I so much appreciate every single one!! To WendyB, I've emailed you my dear! To Looking fab in your forties, I didn't realise QVC did KJL either, plus its a fair bit cheaper too! I adore the first one! YUMMY! Ooh what lovely picks! I can't wait till you recieve them and we get to see them in the flesh! Over the weekend, I went to a Lia Sophia Jewelry party. Hmmm..some cool stuff, but pricy. All I can say, its much cheaper on E-Bay. You make 40 young honey! Kenneth jay lane has the most gorge pieces! Oh, I am sure you made some sweet deals. Can't wait for you to get them. oooh i love birthday shopping! for me, for my family, for my friends! i think is as exciting as buying x-mas presents!!!! the selection is very nice!!! First off, you look waaaay too young to be 40! And I love the idea of investing in good jewelry. You must take lots of photos once you get your presents! The necklaces you picked are lovely. Hi everyone-thanks for all the fabulous comments, so much appreciated and if I keep the necklaces, I'll certainly show them off to you! QVC really does have a great jewelry selection, don't they?? Lovely, classic choices! Hi Tara-unfortunately, this time round they weren't right, but I would still order from them again.